Do you wan’t to try ExpressVPN Premium and didn’t know how to try it for 30 days trial without paying anything? Here, we will talk all about the ExpressVPN trial and money refund process. ExpressVPN is one most dominant & reliable VPN service and you can go for the premium plans without taking trial because ExpressVPN also gives 30 days money back guarantee. So after purchasing the premium plan you will get any disappointment. When you check Express VPN plans, then you see a bit higher price, if we compare to Top VPN Services. But they work really hard to giving complete satisfaction to the customers. And when you prefer performance & satisfaction more than cheaper price, than ExpressVPN will never disappoint you. However, if you still want to use its performance and reliability then you can take the 30 days free trial via given method. ExpressVPN doesn’t offer a Free trial instead they offer prepaid trial. Means, if you want to use ExpressVPN trial, first you will need to pay full money of their any plan and later before 30 days if you’re not satisfied with the service, then you can ask for the full money refund. After that your money will be credited to your Bank account. I’m not agree with the new terms and conditions but they are making this restriction to protect themselves from Free trial fraud. So We can say, this is not a free trial because we first need to pay and later need to ask for refund, instead of free trial it looks like a money refund guarantee policy. Therefore many of our users were asking me via email and comments because I have listed the ExpressVPN in our Top 5 VPN services free trial offer. And users are complaining about that ExpressVPN is not giving free trial and they ask for money first and later we will need to contact them for refund. 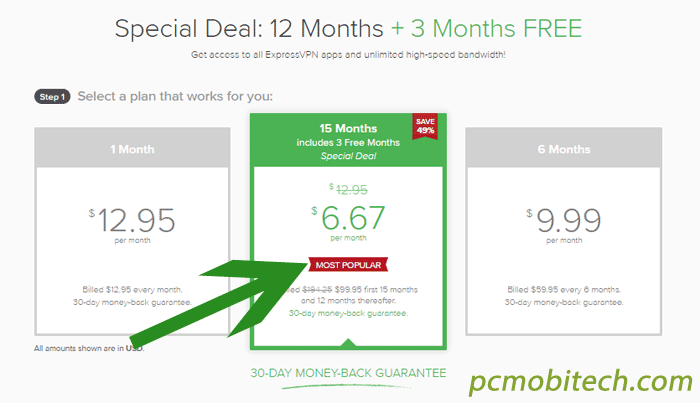 Hence, We are writing full description about the ExpressVPN Free Trial Offer. It is now clear that they don’t offer free trial, if you really want to try ExpressVPN then go with premium plan and take advantage of 30 days money refund. Once you fully tested the service and it is not expected as they have described, just ask for the refund but do this before 30 days otherwise, you will not get the refund. HideMyAss VPN Free 7 Days Trial. How to try ExpressVPN for 30 days? Now we are sharing the process the full method how to try ExpressVPN and get the full refund, please note that it is not a free trial because you’re already paying full amount of the premium service but you can ask for the refund before 30 days and they will give 100% full money refund without any question. First Go to ExpressVPN trial offer page, click here to visit. and click on the Get ExpressVPN button. After that, select any of given VPN plan, you can select any plan because all the plan come with 30 days money back guarantee. So even, if you choose 1 month plan, then you can ask for the full money refund within 30 days. Please take care before selecting any plan because if you choose short term plan such as 1 month, then you will not get the ExpressVPN special deal as you get on the 12 months plan. 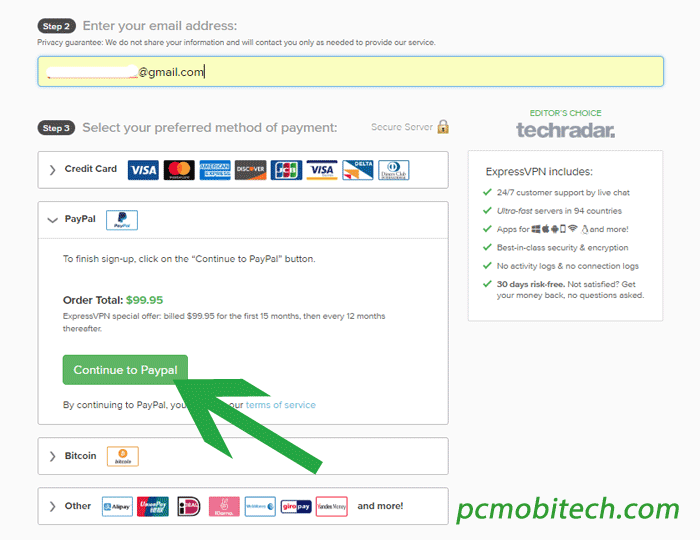 Now on the next page, enter your Email id and complete the payment using any of given payment method including: Debit or Credit Card, PayPal, Bitcoin, and others. Once the payment and signup process completes. Go to your Email account and Open the Welcome Email. The Welcome email that you have received from ExpressVPN consists a link, click on the link then login to your account. Now You can download and install ExpressVPN apps for Windows, Android, Mac, iPhone and Linux, etc. If you don’t know how to setup ExpressVPN then check this. And after that enjoy the service for 30 days. Please note that you can ask for the refund within 30 days, if you ask after 30 days then ExpressVPN will not return your money back. 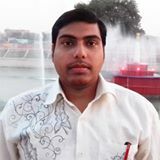 I hope, you will find the post helpful, if you still have any query let me know, I will try to give your answer.